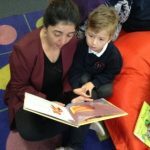 Every Friday from 8.50-9.10am in Nursery and Reception we invite parents to come into class and read with their child. 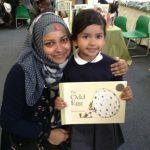 This is a lovely opportunity for parents and children to relax and read picture books for pleasure. 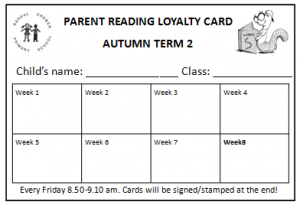 Come every week to Parent Reading and get your loyalty card stamped. 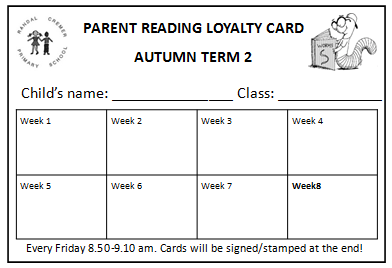 If you get all your stamps yo will be entered into our half-termly book prize raffle. 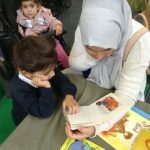 If you cannot attend on a Friday morning due to work or other commitments speak to your child’s teacher and you can arrange another slot in the week to read with your child and school. 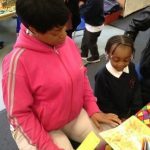 On the last session of each half term we use this time to share children’s learning journey in their Special Books. 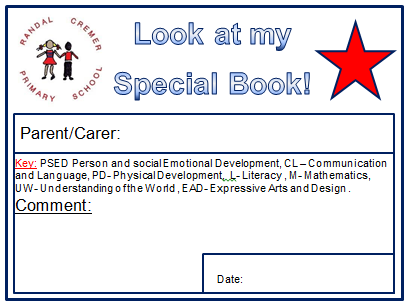 We ask parents to fill in a little comment slip like this with a special message to their child. 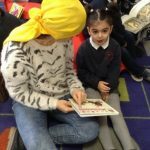 At Randal Cremer we run workshops for EYFS parents twice every half term. 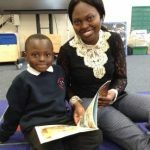 We invite different members of staff and specialists from outside the school to speak to parents on a broad range of topics. 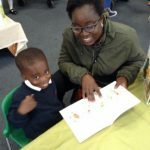 In previous years we have had sessions on ‘Early Writing,’ ‘Supporting your child with Maths at home,’ and ‘Phonics support.’ We invited a nutritionist in to talk to parents about healthy eating and an Educational Psychologist to provide hints and tips for managing behaviour at home. 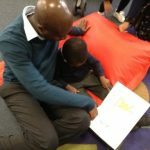 We have even had a few ‘Dads only’ sessions with some fun and exciting activities to support fathers and male carers in how to play at home! Every workshop starts off with a 15-20minute input with just the parents, centred around our focus topic. 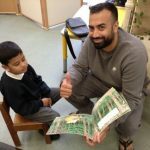 After the input from the workshop leader, we invite the children into the session to take part in some practical activities. This gives parents and carers the chance to experience our ethos of learning through play. These workshops have already been delivered, but you can click on the PowerPoint to find out the key information. Speak to your child’s class teacher or to Torie if you have an idea for a future workshop. 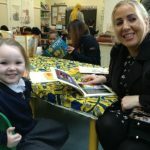 We have termly Parent and Teacher meetings at Parents’ Evenings.